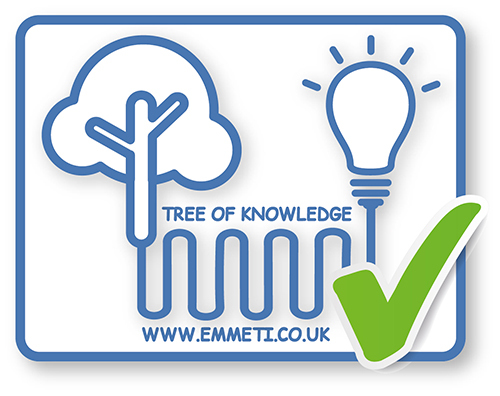 By using an Emmeti Hot and Cold Water Manifold System to distribute water around a property through its own circuit of pipe it is possible to isolate each individual appliance or outlet at one central location in the event of a problem or maintenance being required. 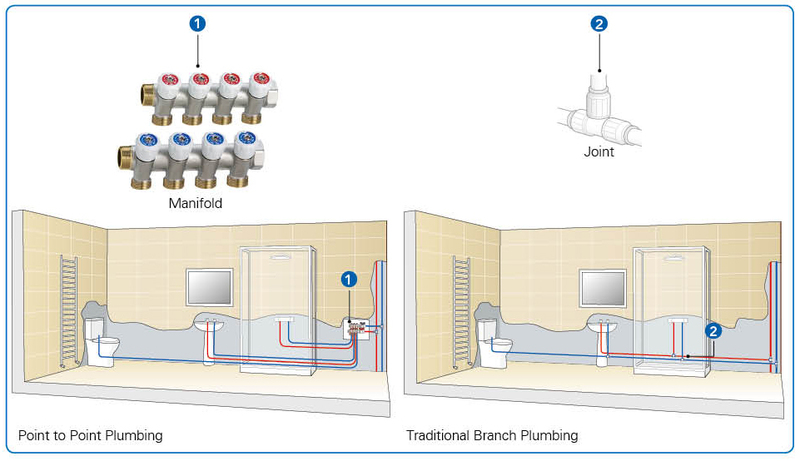 The user will be able to isolate parts of the system whilst the rest remains operational, reducing disruption to the rest of the building .Using this type of point to point plumbing configuration you can greatly reduce the number of joints in your system, speeding up installation time and vastly reducing the chances of a leak. Emmeti Hot & Cold Plumbing manifolds are WRAS approved for use in potable water systems and have BBA approval. Point to point plumbing is a method of installation using a manifold to distribute hot and cold water to items of sanitary ware and appliances around the property (such as washing machines, sinks, baths, dishwashers, and so on). Each individual outlet is supplied using a continuous length of pipe from the manifold, with joints at the outlet and at the manifold only. This reduction of joints in the system reduces installation time and vastly decreases the potential for leaks, which can lead to costly repair claims and damage to reputation. The examples above show how the use of a manifold eliminates all concealed intermediate joints (that could potentially leak) against the conventional method of installation. The pipe distributed to each outlet can be tailored to suit individual requirements i.e. 16mm to shower and 10mm to basin and WC. The manifold shown also allows for isolation at each outlet in the event of any repair work or maintenance. A joint in a water system is the most likely place for a leak to occur. We offer the ability to greatly reduce this potential risk by reducing the number of joints in the system. The table shows the principles of point to point plumbing. There is a huge difference in the number of joints between traditional branch and point to point systems (up to 70%), saving installation time and vastly reducing the potential for a leak. The reduction in fittings along with the speed of installation can offset any additional costs incurred when purchasing the manifold and additional pipe. Provides you with individual isolation of sanitary appliances if required. You are able to isolate parts of the system whilst the rest remains operational, reducing disruption when carrying out repairs or maintenance*. Reduced installation time of between 30%-40% due to less joints. Gives you a reduction of up to 70% of joints, with virtual elimination of tees and elbows, therefore less chance of leaks. Ensures that you have good accessibility in the event of a problem – limits the points at which a leak could occur to the point of use and the manifold, significantly reducing the time for fault finding. Emmeti Monoblocco connectors allow you to tailor the outlet sizes for different pipe sizes going to different outlets. You can therefore optimise the pipe size to be installed per outlet. Allows an easier understanding of water system schematics in relation to points of isolation. This will ensure future maintenance and repair can be carried out with minimum disruption. Provides you with first fix isolation benefitting your build program. Benefits health and safety on your project, cuts down the amount of hot works on site. Provides you with considerably reduced maintenance costs through less disruption, down-time and maintenance engineer cost and time on site. Having good accessibility will mean that your ongoing water risk assessments will be easier to conduct. Manifolds give you a precise, neat design and layout allowing a convenient central location for distribution, service and maintenance. Manifolds installed in riser or service cupboards mean lack of disruption to the building occupiers and ease of repair/maintenance for engineers. Can offer cost savings due to shorter lengths of primary hot and cold pipework between the source and manifold.